The Tufts Engineering Chapter of Engineers Without Borders participated in Tufts Community Day on September 30, 2018. 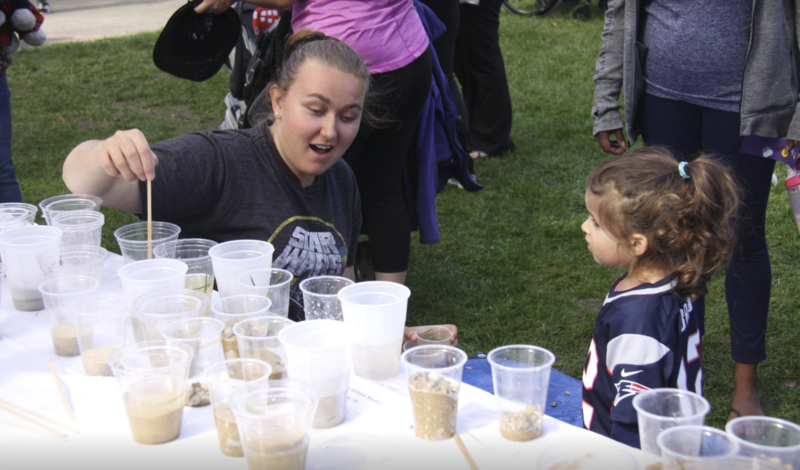 Community Day is a yearly event where Tufts clubs set up activities and events and people from the surrounding communities are invited on to campus. The event attracts families, neighbors, and lots of fun. This year was no different, especially due to the beautiful weather and commitment of Tufts to engage with our neighbors in Medford, Somerville and the greater Boston area. This year, the EWB table consisted of an educational activity on water filtration, meant to facilitate a discussion with community members about the importance of clean water around the world. Members from both our Malawi and Nicaragua teams were present, mostly interacting with children ages five to ten. Anyone who approached the table was given a clear cup, sand, and gravel. The children layered the sand and gravel to create a filtration system. EWB representatives then poured pre-mixed muddy water through the cups, and children watched as the water changed from muddy to clear. Some children performed the process in many iterations, while other children became impatient with the time required to filter the water. Both reactions were welcome, as it is important to understand how long it takes to filter water to become drinkable, much less clear. Children and their families were asked to reflect on their own experiences with water and the importance of water to in their daily lives. Our respective projects were then introduced, in an effort to create the connection between the hands-on activity and the greater picture - not everyone has the privilege of access clean drinking water. This was a great opportunity to engage with the community at large and raise awareness about our current projects that provide access to clean water to communities that lack it.